I remember trick or treating as a child with my dad as one of our family traditions for Halloween. That and carving a pumpkin were our two Halloween traditions. Now that I have my own children, I’m keeping those family traditions for our Halloween and adding to them. For many reasons, Halloween is one of the boys’ favorite holidays. Ok – it’s really just one reason: candy. For the sake of variety, I’ve tried to throw a few other fun things into the mix! If you want to know more about the traditions of Halloween and its history – this is a great place to start! Family Traditions for Halloween: Decorate The Outside Like Crazy! My youngest son and I spent some quality time alone together putting up the front door decorations and decorations inside as well. 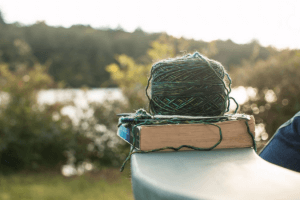 We always begin with outdoor decorations. But I admit that I sort of cheat on this one. All of my front porch decorations are really fall decorations. Garlands and lights around the front door, corn stalks in the corners – all fall. On top of that, I “layer” some pretty easy to put up and take down Halloween decorations – a wreath for the door, light up ghosts along the path and some scarecrows that go into the front porch planter. Who Doesn’t Love Halloween Sheep??? And, of course, you can’t have Halloween without pumpkins. We take a trip to the pumpkin patch and each pick out our own pumpkin. For the past two years, for my youngest, we’ve decorated his pumpkin instead of carving it. And before you say “boooooring….” We used Mr. Potato Head parts to make the most fun pirate potato head pumpkin! The year before last, it was the ghost pumpkin of Mr. Potato Head! The sets are inexpensive and a great solution for the younger set who isn’t ready to wield a knife, even with help. For my older son, he loves selecting from a pattern book and then using a power drill to do the actual “carving.” Boys. This year, I’m going to try roasting our scooped out pumpkin seeds. I love pepitas, but have never made my own. The boys will save a couple of seeds to plant in the garden and I’m planning to roast the rest. One of my favorites uses for pepitas is an awesome cilantro pesto that I make. My youngest and I had a great time planning this hall table and putting up all the decorations – including our Halloween tree. We have a Halloween tree. Yes – we have a decorated Halloween tree and (see above) Halloween sheep. Weird? Maybe. But a great family tradition? Absolutely. And that’s all I have to say about that. We’ve started our own family tradition of having everyone from the neighborhood over who wants to come and join us for fun, play, hot dogs and trick or treating. We usually have a gang of about 20-30 friends and neighbors. The mob is marvelous and the adults take charge of whatever children are close by. No chasing your child to keep up. No waiting because they’re too slow. Some of the younger ones get pulled in wagons. Picture organized chaos at its best! I always make tons of hot dogs – no buns. When everyone arrives, there are hot dogs for the kids. It’s my sneaky way of trying to get them to fill up a little before the onslaught of sugar. And I don’t allow the switch witch into my house! The rule is that they boys can eat as much as they want Halloween night. (Of course, for our older son with both food sensitivities and allergies, inspecting before he eats anything is really important!) Once we are home, the boys enter into skilled negotiations that I can only liken to those that led to the Treaty of Versailles. Candy is valued and traded. Candy that you don’t like and are trying to “get rid of” is definitely less valuable. After that, all candy is theirs. But…and here’s the catch: they keep it in a basket and they choose one piece each evening for dessert until it’s all gone. Letting them make their choices has been fabulous and the truth of the matter is – I don’t think there’s been one year that they’ve actually finished all the candy. By that time, the novelty has worn off. Each year, I try to add in something new or special. This year, I found a recipe for candy corn vodka. I may just have to put that in a cocktail and serve it! And finally, once the boys have crashed in bed and my head has hit the pillow, I have one final tradition. Or maybe it feels like an obligation so the Universe doesn’t send me any bad vibes. I send out a prayer for all teachers everywhere. For I know that tomorrow may be one of the worst days of the year for them. All of the children in every class will be under-slept, over-tired, and over-sugared. They will be rowdy and unfocused. 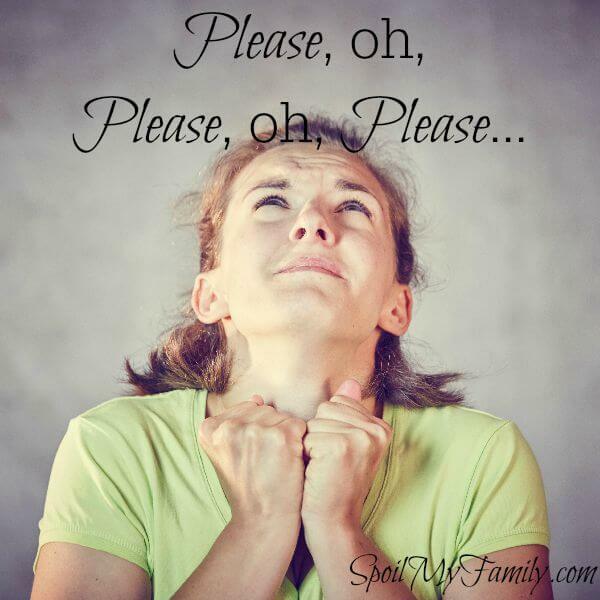 Dear Lord, please bless the teachers for not canceling school every year on November 1. Please watch over them and give them peace and patience to remember that they actually love our children and care about them – no matter how they may behave tomorrow. Dear Lord, please help our teachers to remember that parents love and respect them, despite the fact that we sent our children to school on November 1. Oh no!!!! This year Halloween is on Saturday! Revise that prayer quickly: Dear Lord, please let me find a babysitter for Sunday! 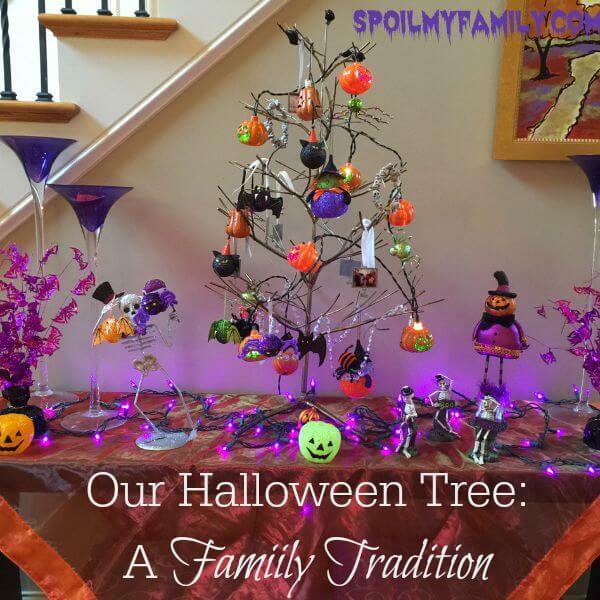 Give our family traditions for Halloween a read, check out some other tried and true Halloween ideas from my friends, or you can always find more great ideas to get you in the spirit of Halloween on my Halloween Pinterest Board. 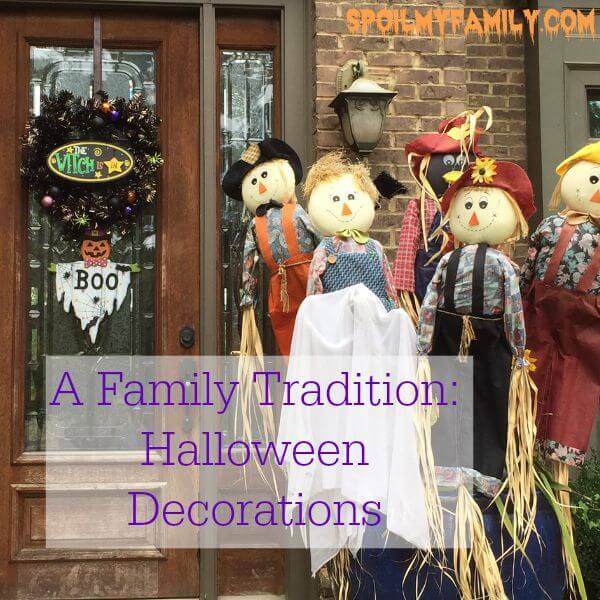 If you enjoyed reading about our family traditions for Halloween, hop on over and give some other tried and true ideas for Halloween a look-see. I’d love to have you connect with me here, or on facebook or twitter, and let me know your favorite family traditions for Halloween! Hillary from The Cole Mines is sharing her family’s Halloween Traditions For Young Children. Trina from O’Boy Organic! is sharing Healthy and Fun Halloween Traditions for Families. Brea at Brea Getting Fit shares her family’s recipe for Mini Paleo Pumpkin Muffins. 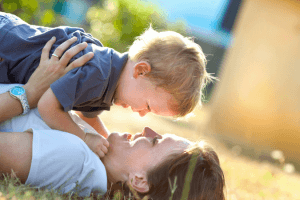 Erin from Bambini Travel has great Traditions for Families with Young Kids. Amy from Umbrella Tree Cafe shared her really fun Easy Halloween Lunch Box Ideas. Don’t forget to Pin this so that you can come back and pick up a new tradition each year! Oh I am loving your Halloween sheep!! It’s the silliest things your kids will remember long after they are kids. I agree. It’s strange – they love the candy and the immediate gratification of it all – but they will never remember what candies they got. But sheep? Yup – they will remember that silliness. Thank you! I truly feel for teachers the next day! But this year it will be me!!! I love the Halloween sheep! Such a cute idea. My daughter’s birthday is on Halloween so we get cake with our candy. Last year my husband insisted on getting her a pinata! Like really?! They need more candy? Hahahahaha!I really hope you said an extra prayer for her teacher! So fun to have your birthday on Halloween! Thanks for sharing! So cute – love that you are carrying on the family “traditions” with your kids! And I love love the Halloween tree! So cute! The tree has taken on a life of its own! I usually have it strung with a strand of crystals and “ornaments” with a family photo from each year. Then it gets gussied up at various times of the year! Thanks for stopping by! Traditions are so important in a family. I love your cute sheep. And that prayer at the end of the day? Teachers everywhere thank you for that. Oh! Thank you so much! The sheep are my favorites 🙂 They are actually festive for many holidays throughout the year! 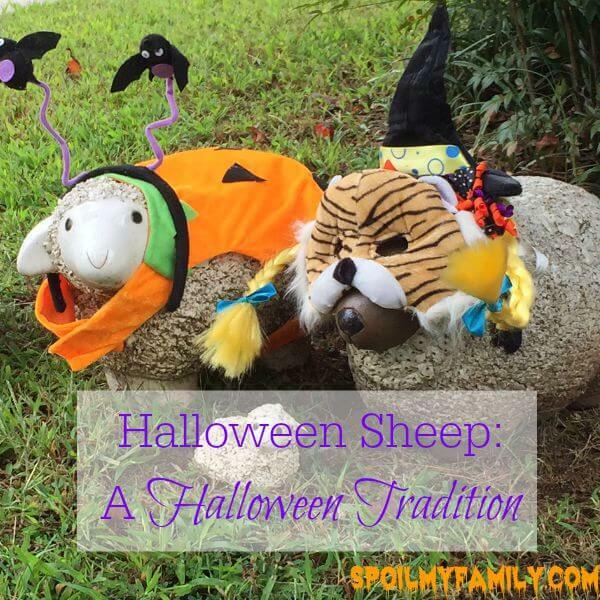 You have some awesome family traditions, I especially love the sheep!! Thanks!! Glad you stopped by!